The struggle between a weakening global economy and the shrinking availability of oil supplies seems to be tipping in favor of the latter as oil prices slowly make their way higher. The electric power disruption in Venezuela has combined with the US sanctions on Iran and Venezuela and reports that the rapid increase in US shale oil production to add a bullish tone to the oil markets. Last week oil prices climbed $1-2 a barrel to close at $67 in London and $58 in New York. Last week a new EIA forecast cast doubt on the optimistic projections for US shale oil production which was slated to increase from 11.9 million b/d at the end of 2018 to 13.5 million by the end of 2020. For the last ten years, the US shale oil boom has been primarily financed by multi-billion-dollar loans and stock offerings. As is well known, most firms in the shale oil industry have never made money despite the rapid increase in production and it now seems that the lenders that the sector has been depending on have had enough. 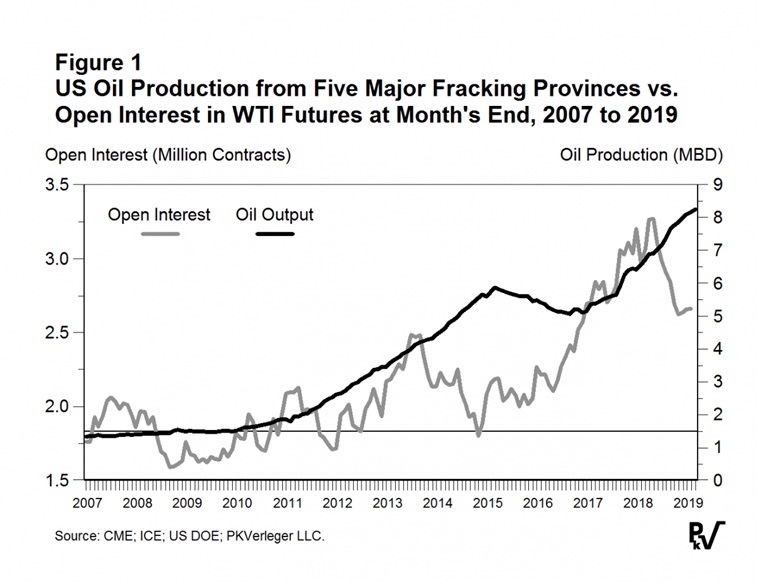 Data on the issuance of debt and equity by shale firms and their positions in futures markets are providing an indicator of their future production, and these are pointing to a significant decline in output in the next two years. A new analysis suggests that US shale oil production may fall in the next two years to some 11.3- 11.5 million b/d rather than climbing to 13.5 million as currently forecast. Should US shale oil production peak in the next two years, and as seems likely, Venezuela’s oil output fall by some 500,000 b/d, the global oil market would undergo a sea change. Oil could move strongly higher—to $80, perhaps even to $100 again—which could lead to a fall in economic growth, perhaps precipitously. World oil prices have been held in check by ever-growing US shale oil production. When this comes to an end, there is little to replace it as a way to keep increasing the world’s oil supply. Investment in development dropped rapidly a few years ago and has yet to increase to the level that can supply world demand that has been growing at 1.5 million b/d. Some are looking to the major oil companies to take over the majority of production in the Permian Basin from small drillers and to keep production growing. Although these companies have a lot of spare cash from conventional operations, they have to prove they can be any more profitable than their smaller rivals. Discussions of just when world oil production will peak have been dormant since the development of shale oil production ten years ago. Now, these discussions have begun again with some observers, outside of the industry and the mainstream financial press, talking about the peak being very close. We seem to be entering a time of much disagreement about the immediate future of the oil industry with some seeing lower production and higher prices just ahead, and others plenty of oil and moderate prices for many years to come. The OPEC Production Cut: Saudi Arabia’s Energy Minister al-Falih said OPEC will continue producing less crude oil than it could until at least June. A decision in April, when OPEC+ meets again, would be too early to end the cuts. “We will see where the market is by June and adjust appropriately.” The Saudis believe demand for crude will remain healthy this year, driven mainly by the US and China. Rising demand from China, which the Saudis expect will reach 11 million b/d this year will require more Saudi crude. The Kingdom announced last month it was planning to increase its oil exports to China this year to 1.5 million b/d from 1 million. US Shale Oil Production: There was much optimism at the CERA WEEK conference in Houston for ever-increasing production from the Permian Basin. Other US shale oil basins do not seem to offer much in the way of growth prospects. The IEA seems even more optimistic than the CERA conference speakers when it said last week that the US would drive global oil supply growth over the next five years by adding another 4 million b/d to its output. The agency says that US oil production, including natural gas liquids and other hydrocarbons, will climb to 19.6 million b/d by 2024 from 15.5 million last year. Moreover, the US is expected to double its gross crude oil exports to 4.2 million b/d by 2024, while total exports of oil and refined products should reach 9 million b/d. Chevron and Exxon are emerging as top players in the Basin, while European companies BP and Shell are growing their operations there. These firms have size, economic diversity and the finances to theoretically produce oil and gas with fewer emissions and at a lower cost. Chevron and Exxon made a stir at the CERA conference when they said they each plan to produce almost 1 million barrels of oil equivalent a day from the Permian within five years — roughly triple their current output. Chevron holds more than 2 million net acres in the basin and watched as smaller companies eventually found success with horizontal drilling techniques and hydraulic fracturing. Now, Chevron is using its size and technology to rapidly ramp up production, employing a factory-model in which many wells are drilled, fracked and completed in a standardized, repeatable way. The IEA said that the involvement of major producers in shale oil production would stabilize the markets as they are better able to keep on drilling no matter what the price. Exxon plans to reduce the cost of extracting oil in the Permian to about $15 a barrel, a level that is only seen in the giant oil fields of the Middle East. The scale of Exxon’s drilling in the Permian means that it can spread its costs over such a big operation that the basin will become competitive with almost anywhere in the world. This is indeed a bold claim, and even if true, Exxon still has the problem of finding places to drill with a diminishing number of sweet spots and coping with depletion which grows larger every day. Shell has a more modest involvement in the Permian, but still is looking to grow there. As a European firm, with more domestic pressure over emissions and climate change than US firms, it has begun to link its carbon emission targets to its executive compensation. On Tuesday, Gretchen Watkins, president of Shell’s US subsidiary, called on the White House to tighten the rules on methane leaks from oil and gas production rather than roll them back as proposed. Iran: According to OPEC, Tehran’s oil production has been holding steady at around 2.75 million b/d after dropping by about 1 million b/d in the six months after the US sanctions started last year. Washington believes that Iran has lost $10 billion in revenue since US sanctions began in November and that about 1.5 million b/d of Iranian crude has been removed from global markets. Brian Hook, the State Department’s special representative on Iran, said at the CERAWeek energy conference that due to a global oil surplus – in part due to record US production – the US is accelerating its plan of bringing Iranian crude exports to zero. Washington wants to cut Iran’s crude exports by about 20 percent to below 1 million b/d from May by requiring importing countries to reduce purchases to avoid US sanctions. However, Hook also said that the current waivers, which allow Iran’s eight biggest customers to purchase only a limited amount of oil from Iran, could be extended if the sanctions on Venezuela and its numerous other problems significantly impact global oil supply and prices. This is the first indication that Washington is becoming worried about rising oil prices and may be willing to back off pressure on Iran for a while. Tehran is searching for second-hand oil tankers to replace its aging fleet and keep crude exports flowing as US sanctions start to take effect. Talks with South Korea for up to 10 new supertankers have stalled, and Panama has removed at least 21 Iranian tankers from its registry, forcing Tehran to step up the search for more tankers. Potential sellers of vessels are warier under the new round of sanctions after a Greek network that helped Iran buy tankers under previous restrictions was blacklisted. Western insurers are steering clear of Iranian vessels, and Iran’s attempts to export crude to the US-approved buyers is further complicated by having to put its tankers under its own flag, rather than a third country such as Panama. Iraq: Baghdad’s oil production continues to creep higher despite its adherence to the OPEC+ production cut. The federal government has roughly doubled the amount of its monthly transfer to the Kurdistan Regional Government — a sign of a deepening relationship of interdependence between Baghdad and Erbil. The 2019 budget law calls on the KRG to contribute 250,000 barrels per day of its independently managed oil production to the federal government’s exports – and if it fails to do so, there could be financial penalties. Iraq and China are set to conclude a bilateral agreement that would give Iraqi investors access to roughly $10 billion worth of financing. The deal is likely to accelerate the pace and widen the breadth of China’s involvement in the Iraqi economy, including the energy sector, and provide the money needed for reconstruction and infrastructure projects that cannot be funded by the Iraqi budget alone. Saudi Arabia: The Saudi kingdom plans to cut its crude oil exports in April to below 7 million b/d while keeping its output “well below” 10 million, as the kingdom seeks to shrink the supply glut and support oil prices. Aramco’s oil allocations for April are 635,000 b/d below its customers’ requests for oil. The planned cut in Saudi exports, when combined with a similar amount of lost Venezuelan exports, is likely to have a severe impact on oil prices this spring. Saudi oil minister al-Falih said last week that China and the US would lead healthy global demand for oil this year but that it would be too early to change OPEC+ output policy at the group’s next meeting in April. He said total global oil demand is set to grow by around 1.5 million b/d. Saudi Aramco’s board met last week to approve a $10 billion bond issue that would help finance the acquisition of a 70 percent stake in Saudi petrochemicals maker SABIC. The company’s representatives are expected to meet fixed-income investors in a bond “roadshow” in April. Libya: The Sharara oil field in Libya will recover its output to 300,000 b/d within two weeks. The country’s largest field has been plagued by outages, the latest of which lasted almost three months. The field was shut down in December when clashes between militant groups forced the National Oil Corporation to declare a force majeure after locals occupied Sharara with demands for better economic conditions and power supply security. The uprising lasted until early February, when the Libyan National Army, a group affiliated with the eastern Libyan government, took control of Sharara. Growth in China’s industrial output fell to a 17-year low in the first two months of the year, pointing to further weakness in the economy. Pressured by weak demand at home and abroad, industrial output rose 5.3 percent in January-February, less than expected and the slowest pace since early 2002. Growth had been expected to drop to 5.5 percent from December’s 5.7 percent. China combines January and February activity data in an attempt to smooth distortions created by the long Lunar New Year holidays early each year, but some analysts say a clearer picture of the economy’s health may not emerge until first-quarter data is released in April. US tariffs are likely partially responsible for weak factory output. Trade data released last week showed Chinese exports declining by the most in three years. “Due to the trade friction, a lot of factories rushed to handle imports and exports before the lunar new year. Now they’re mostly in an observation mode as they wait to see if the tariffs will be lifted.” President Trump warned Beijing on Wednesday that he would not sign off on a trade deal that didn’t meet US demands, in a sharp departure from his recent optimism. Amid signals that the US and China have made some progress in trade negotiations in recent weeks, China has tentatively resumed buying US commodities – something it had stopped doing during the peak of the trade dispute in the summer and fall of 2018. China is now once again importing US crude oil and soybeans, but the Chinese response to US LNG offers is still weak. China’s refinery crude throughput rose 6.1 percent year on year to a record high of 12.73 million b/d over January and February, according to preliminary data. The year-on-year growth over the past two months was lower than the increase of 7.3 percent seen for the same period in 2018. Asia is drowning in Chinese fuels, and things are about to get worse over the next three years as new refining capacity begins operating. There are several factors at play here, including the rise of the teapots, slowing economic growth, and perhaps a “less-than-accurate” forecast of future fuel demand trends in China. The teapots—China’s independent, private refiners—are the primary driver of the glut that is choking off Asian refiners’ margins and pressuring prices. China expanded its coal-to-gas and projects to 35 cities in 2018 from 12 cities the previous year, Environment Minister Li Ganjie, said last week as Beijing stepped up its fight against smog. China’s winter heating program used to burn an estimated 400 million tons of coal a year and switching it to cleaner types of fuel is a primary part of the country’s war on pollution, now in its sixth year. The program to convert households to low-emission heating ran into difficulties last winter amid widespread natural gas shortages, but 4.8 million households still managed to make the switch from coal to natural gas and electricity last year. At an energy ministry meeting earlier this month, Russia’s oil majors confirmed that they would be sticking to the production cuts that Russia had pledged in the OPEC+ deal. The firms have not discussed production plans for the second half of the year and have decided that they would do so after April. Moscow has identified opportunities when it comes to the changing climate and the gradually decreasing icecap of the Arctic region. Moscow’s Arctic Strategy is intended to provide an edge for the Eurasian country in the areas of energy and defense while at the same time promoting the Northern Sea Route as an alternative shipping route. Russia has vast oil and gas reserves in the Arctic. In terms of technically recoverable energy, the region contains as much as 90 billion barrels of oil and 47 trillion cubic meters of natural gas of which the Russian zone has the largest share, 48 billion barrels of oil and 43 trillion cubic meters of gas respectively. Public support for the Kremlin and President Putin has slumped in recent months. The government’s popularity had spiked after Russia annexed the Ukrainian territory of Crimea in 2014, catapulting Putin’s approval rating to near 80 percent, where it remained for nearly five years. Over the past six months, Putin’s rating has crashed. True, the most recent poll by an independent Russian polling organization suggests that 64 percent of Russians continue to approve of Putin’s work as president. That is the lowest number since 2013 when Putin returned to the presidency amid anti-regime protests. The German-Russian Nord-Stream 2 pipeline project had been a bone of contention between Berlin and Washington, which fears it will make Europe’s largest economy excessively reliant on Russian energy. However, work continues on the gas link under the Baltic Sea financed by several Western firms and Gazprom, the Russian state-controlled energy company. The dispute is coming to a head. The Trump administration contends the pipeline would prop up Moscow, still under Western sanctions for its 2014 Ukraine invasion. Berlin says the pipeline would improve the continent’s energy security. Gazprom already operates gas links to Europe that traverse Ukraine. The group building the Nord Stream 2 pipeline to import Russian gas into Germany is exploring plans to hive off its last 50km into a separate company, a move that would undermine EU plans to regulate the entire $9.5bn project. Under the proposal, a new company would own and manage the small part of the undersea pipeline within German territorial waters. While this section would be subject to EU rules, the rest of Nord Stream 2 – nearly 1,200km through the Baltic Sea – would remain outside the bloc’s jurisdiction. Normal crude oil export operations were restored on the 150,000 b/d Nembe Creek Trunk Line following the plugging of a leak which resulted in the shutdown of the facility on February 28. A spokesperson for the operator of the 97-kilometer crude oil pipeline said the facility “is up and running”. The restoration of normal operations has allayed fears of a significant disruption of oil exports on the pipeline, which brings crude oil to the Bonny Oil Export Terminal. The Nigerian government does not allow oil companies operating in the country to announce that a terrorist attack on an oil facility has caused any damage. The only clue that an attack has closed a pipeline is when a company declares force majeure on oil exports. During the recent Presidential election, militant groups threatened to resume attacks on the oil infrastructure if President Buhari was reelected. So far there is no evidence that the militants have resumed attacks that were able to shut down several hundred thousand b/d of Nigerian oil production. At week’s end, electric power seems to have been restored to much of the country although there are scattered outages and two of the three “upgraders” that prepare heavy oil for movement are still out of service. For most of last week, little oil moved anywhere in the country, and it is unknown how long it will take to resurrect the 1 million b/d that the country was producing before the lights went out. Analysis of satellite imagery shows a brush fire burning below the high-tension lines that move power from the Guri dam to the cities. Experts are saying that the lack of funds to clear brush from beneath the power lines was the likely cause of the nation-wide disaster. Power surges during the event damaged or destroyed an unknown amount of power-switching equipment. The whole national grid is in deplorable condition so that more power outages are likely. Before the blackout, Venezuela’s oil production was falling at the rate of 50,000 b/d each month so that even if the oil industry receives the electric power it needs to operate, it is likely to shrink due to numerous other problems. In its Oil Market Report for March, the International Energy Agency warned that as Venezuela’s oil industry was so severely disrupted by the crisis that the loss of production could present a challenge to the global oil market. However, the IEA noted that Venezuela’s current level of production is about the size of the output cuts agreed by OPEC+ and that OPEC is now sitting on top of 2.8 million b/d of spare production capacity which could replace Venezuela’s production in the event of a complete collapse. Even though the main oil export terminal resumed operations on Friday, Venezuela’s political/economic crisis continues with the US planning still more sanctions as it withdraws its remaining diplomats from the country. There is little food left in the country and gangs of armed government supporters on motorcycles rule the streets.